When I was five or six, my Auntie Annette brought me a pre-release copy of the book A Very Young Dancer, which was the story of the young girl who was playing Marie in that year’s production of The Nutcracker. Like most little girls who grew up in the seventies, I took the requisite ballet classes when I was little. While I switched to tap and jazz before I was ever on pointe, my body still remembers a lot of those early ballet classes, and it’s no coincidence that the railing in the upper hallway of my house is barre height. I don’t dance anymore. I haven’t in years. But I’m still a fanatic for ballet, so when I was offered the chance to review Girl Through Glass, I didn’t merely leap at the chance; I did a grand jeté. First, I really loved the way this novel was structured. By alternating contemporary sections with visions of the past we got to see the world of ballet from two angles. From Mira’s point of view, we saw the harsh reality of dance training, especially when one is good enough to be elite. We meet her apparent benefactor, the older man many girls fantasize about, though Maurice is no typical object of adolescent fantasy: limping and a little peculiar. Even so, he helps Mira glimpse a world beyond that of her mother, who is constantly searching for her true self, and her father, who is establishing a new relationship. I really liked the details included in Mira’s young life – not just descriptions of classes, and the way different teachers interact, but the different sources of ballet slippers, the behind-the-scenes behavior of dancers, etc. In the contemporary story, there were times when I wanted to shake Kate, former dancer-turned-professor, and demand to know what she was thinking. This is a woman who seems to shoot herself in the foot by making low-percentage choices, to the point where they affect her career. 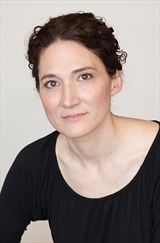 When she receives a letter from a childhood acquaintance, it’s enough to send her into an emotional tailspin, and motivate her to leave her teaching position in Ohio and return to New York to confront the secrets of her past. It should be noted that one of the other structural elements that makes this novel particularly haunting, is the change in person. The Kate sections are written in first person, while the Mira sections are in third person. This serves to further distance the past from the present, and I found it to be an incredibly effective choice by he author. While this novel is likely to be more enjoyable to those readers who know the smell of leather and rosin, who have, at times, owned more leotards than t-shirts, and who danced around their living rooms pretending they were on stage, I believe it’s an appealing read to anyone who is fascinated by the way we change as we move between different stages of our lives. Goes well with smoky Russian blend tea, strong cheese, and crusty bread. 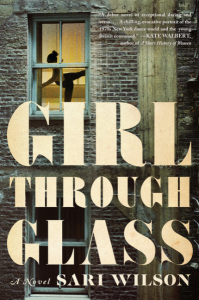 One person in the US/Canada can win a copy of Girl Through Glass. 2) Leave a comment (make sure there’s a valid email address – no one will see it but me) telling me about one of your childhood passions. Were you a dancer? Did you love horses? Were you on a softball team? You have until 11:59 PM US Central time on Monday, February 1st. Girl Through Glass, by Sari Wilson (@sariwilson) #review #giveaway #tlcbooktours by Melissa Bartell is licensed under a Creative Commons Attribution-NonCommercial-ShareAlike 4.0 International License. If the giveaway is for the Girl Through Glass book then count me in! The giveaway info lists another book. I took dancing years ago to correct my turnout after breaking my leg and dance is always something I like to return to… even if only in books. When I was young I had an interest in horseback riding but I didn’t realize how high off the ground I was perched so that ended very quickly. My passion as a child was always reading. I could be found curled up in bed, in my closet with some pillows, or in my backyard reading almost all the time. Ice skating was my passion when I was a child. Dance, figure skating, and books :) As an introvert, I loved activities that I could do on my own, where I was in control of myself. Team sports did not work for me, but dance and figure skating allowed me to forget about everything and release stress. To this day I still love all three–I take a tap dance class once a week, go skating whenever I can, and read daily!